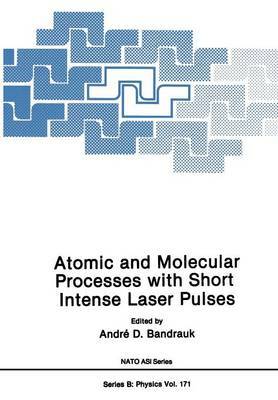 This volume contains the lectures and communications presented at the NATO Advanced Research Workshop on "Atomic and Molecular Processes with Short Intense Laser Pulses" (NATO ARW 848/86). The workshop was held at Bishop's University, Lennoxville, Que, Canada, July 19-24, 1987, under the directorship of Prof. A.D. Bandrauk, Universite de Sherbrooke. A scientific committee made up of Dr. P. Corkum (Laser Physics, ~ational Research Council of Canada), Dr. P. Hackett (Laser Chemistry, National Research Council of Canada), Prof. S.C. Wallace (Dept. of Chemistry and Physics, University of Toronto), and Prof. F.H.M. Faisal (FakultHt fUr Physik, UniversitHt Bellefeld) was called upon to invite and organize eminent lectures in the fields of i) Coherence Phenomena in Atomic and Molecular Photoprocesses. ii) High Intensity Atomic and Molecular Phenomena. iii) Laser Chemistry The aim of the workshop was to bring together chemists and physicists in order to~iscuss and analyze the progress made in the use of short in- tense laser pulses in understanding coherence phenomena and high intensity, nonlin~adiative effects in atomic and molecular systems.